Lua error in package.lua at line 80: module 'Module:Infobox road/meta/mask/country' not found. ↑ The Silk Roads: Highways of Commerce and Culture. Vadime Elisseeff (1998). ↑ Elisseeff, Vadime (2001). 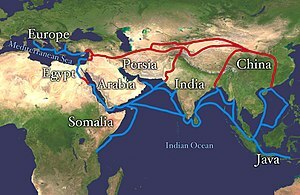 The Silk Roads: Highways of Culture and Commerce. UNESCO Publishing / Berghahn Books. ISBN 978-92-3-103652-1. ↑ Boulnois, Luce (2005). 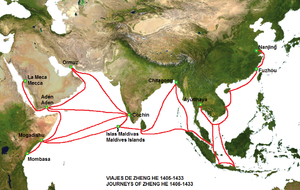 Silk Road: Monks, Warriors & Merchants. Hong Kong: Odyssey Books. p. 66. ISBN 962-217-721-2.